Based on the experimental studies and mathematical modeling method, we have chosen the optimal conditions of the 2,3-dimetylbuta-1,3-diene and 2-hydroxyethylmethacrylate cyclization reaction with obtaining of 2-hydroxyethyl 1,3,4-trimethylcyclohex-3-encarboxylate. 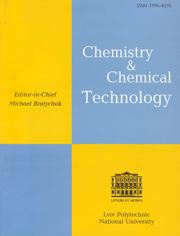 Kunz F. and Polansky O.: Monatshefte fur chemie, 1969, 100, 920. Monnin J.: Angewandte Chemie, 1957, 69, 762. Newman C., Rossiter K. and Sell C.: US Pat. 5175143, Publ. Dec. 29, 1992. Sara Koohi Kamali, Chin Ping Tan and Tau Chuan Ling: Sci. World J., 2012, 2012, 8. Pysh’yev S., Bilushchak H. and Gunka V.: Сhem. & Сhem. Techn., 2012, 6, 105. Korotkova T., Sokolinskaya T., Sokolovskiy Ya. et al. : Nefteprerabotka i Neftekhimiya, 1993, 5, 28. Polyuzhin I., Karp’yak N., Marshalok G. et al. : Voprosy Khimii i Khim. Techn., 2011, 1, 23. Polevaya I., Fedevich M., Polyuzhin I. and Marshalok O.: Zh. Prykl. Khimii, 2011, 84, 261. Polyova І., Polyuzhin І., Маrshalok G. and Fedevych М.: 4 Ukr. Conf. “Dombrovski Khimichni Chytannya” 2010», Lviv 2010, 108. Akhnazarova S. and Kafarov V. (Eds. ): Metody Optimizatsii Eksperimenta v Khimicheskoi Tekhnologii. Vysshaya Shkola, Moskwa 1985. Sautin S.: Planirovanie Eksperimenta v Khimii i Khimicheskoi Tekhnologii. Khimiya, Leningrad 1975.